Tracking my fitness goals through 2014 and beyond! I haven’t updated in forever! I’ve just been super busy. You can catch my most recent Fitness Friday post on My Life: A Work in Progress. Also, I post most of my workouts on MyFitnessPal (find me – I’m emegburg), and frequently check-in on Instagram. www.simplesharebuttons.comLike it? Please share it! This entry was posted in Fitness and tagged blogging, busy, fitness on April 2, 2014 by Elisebet. That’s right…Baby J and I have tickets to go visit Hubby in Florida! We’re staying for just under 3 weeks. I’ve already been scouting online, looking at the base gyms in the area. It looks like one of them has a family workout room, but I need to call tomorrow for the requirements. 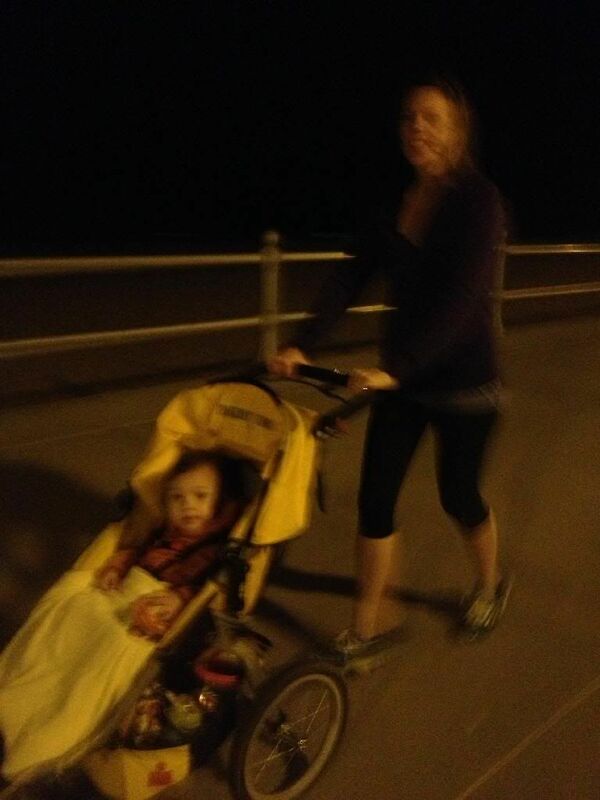 I won’t be taking the jogging stroller, as it’s just too bulky. I’m already going to have a lot to carry and handle, so I’ll have the lightweight stroller. This means J will have to watch Baby J at least three times a week, so I can run…UNLESS I can get good, long runs in on the treadmill. We’ll see. Last week finished off okay. You can read about my week in my Fitness Friday post on My Life: A Work in Progress. I also finished Lorna Jane’s Move, Nourish, Believe Challenge; and you can read my recap HERE, if interested. I did meet my Winter Miles Challenge for the week, woohoo! Just one week left for that, so overall it was a good fitness week. Could it have been better? Absolutely. But I think that’s always going to be the case. I can always push harder. Diet has been so-so. I’ve been struggling with binging. A couple of days ago, I did decide to up my calorie intake again, so maybe that will help. I’m now eating roughly 2,000 calories a day. I think -I hope- that this is the right decision, since I’m lifting more. I still have body fat I want to lose. But of course I need to eat cleaner for that to happen too. So about lifting…I’ve been reading more and more about the benefits of heavy lifting for women. They’ve got me sold on the idea! I have adjustable dumbbells at home and an ottoman that I can use as a bench for now. I also have some pull-up bars and an exercise ball. None of that is ideal, but it will work for now. If I’ve already mentioned all this before, sorry…I can’t remember what I posted the last couple of times. I think I just talked about running or biking. I have realized that I need to be organized more when it comes to exercising. So I’m going start recording in a notebook what weight I did for what lifts, so I know immediately the next time. Then I can steadily increase that weight (or that’s the goal). I also need to map out and plan which days I’m doing what. I’m still training for a half marathon in April, so ideally I need at least one 10-mile jog/run a week. Obviously I don’t want to do legs around that time. So I need to figure out when I plan to do what, and on what days I’ll rest. That schedule needs to be flexible though, as weather is always a factor. In addition, I try to get out for play dates, church activities, etc. often. Here’s a photo of Baby J and I tonight. We had an impromptu run with my running buddy, Nicole. We took advantage of the last nice night of weather before the cold, and went down to the water. The boardwalk is a great stretch to run. It’s just under 3 miles each way! So that’s what’s going on right now. What about you? How was your week and weekend? This entry was posted in Fitness and tagged fitness, jogging stroller, running, update, weight lifting on February 23, 2014 by Elisebet. Getting stronger! And we have orders! Sunny, I mean rainy, Florida! I love to Instagram it! Elisebet on Sunny, I mean rainy, Florida! Nicole on Sunny, I mean rainy, Florida! Cynthia @ You Signed Up For What?! on An injury?